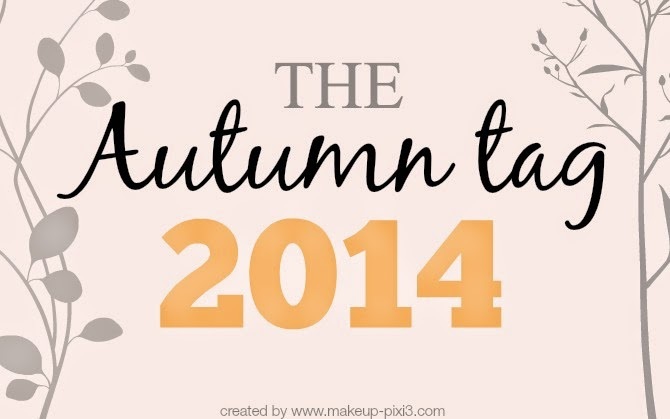 The lovely Georgina of Makeup Pixi3 has created an Autumn Tag that I just couldn't resist doing, you'll have noticed that autumn is a firm favourite of mine. I'm not a coffee drinker despite loving the smell of it. Instead I stick to my Starbucks Chai Tea Latte. If I move away from that I'll drink hot chocolate and I've just found out that Costa do a gingerbread variety - how could I say no to that!? Is everything an option? I have far too many scarves as I don't seem to be able to stop buying them so I tend to layer a lot during the colder months. I love the look of dresses or skirts with tights and boots so that's what I tend to live in when the temperature drops. I don't really change the music I listen to depending on the seasons, although I do listen to more classical music as the year goes on. I don't change my perfume throughout the year, up until a few weeks ago I only had one perfume anyway. At the moment I'm alternating between Angel by Tierry Mulger and Peony and Blush Suede by Jo Malone, the latter is perhaps a little too floral for the autumn but that's not going to stop me wearing it! Anything with cinnamon! Yankee Candles are my favourite scented candles with Autumn Wreath, Cinnamon Stick and Christmas Memories being favourites at the moment. The nights drawing in meaning candles being lit, the fire going on, leaves changing colour and then falling which creates perfect walking conditions. The opportunity to wear knitwear that has been packed away is always good too, not to mention the rugby season starts up again. I stick to the same look all year around, although this year I'm hoping to invest in lipstick in deeper colours rather than the pinks I've been wearing over the last few months. Pulling out knitwear, hats and scarves then heading out for walks around the park kicking up the fallen leaves. After that coming home for a big mug of hot chocolate and getting cosy in front of the fire.